Good afternoon from India! I've been here just over a week, and I have already had so many wonderful food adventures! There are several Indian ladies around town who have yoga students over for lunch. Just call ahead, tell her how many are coming, and at 1 pm a delicious home cooked meal is served at their table! We are in Mysore, so this is all south indian, vegetarian cooking. 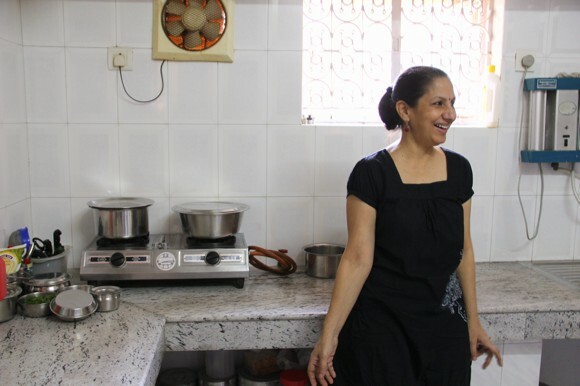 Some local favorite cooking ladies are Shaila, Nagarathna, Anu, and Sandhya (Sandhya even has a cookbook published. 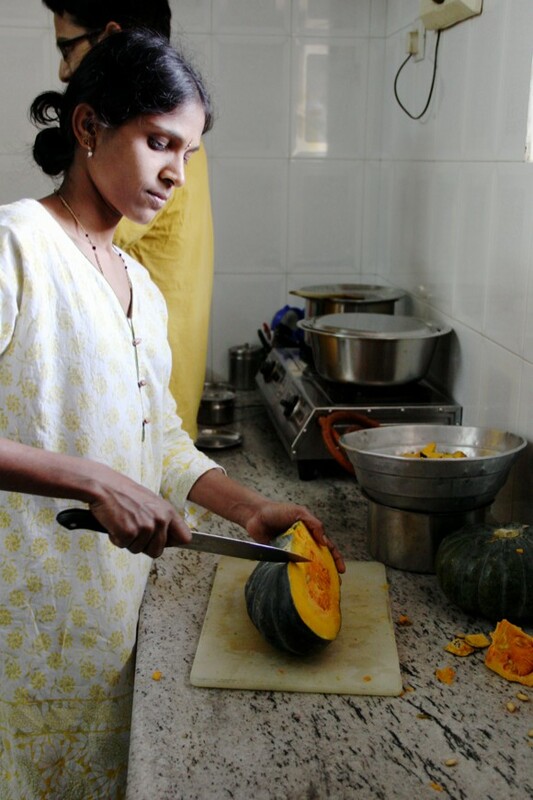 If you want to cook South Indian food I assure you she is the real deal! I ate at her house yesterday). 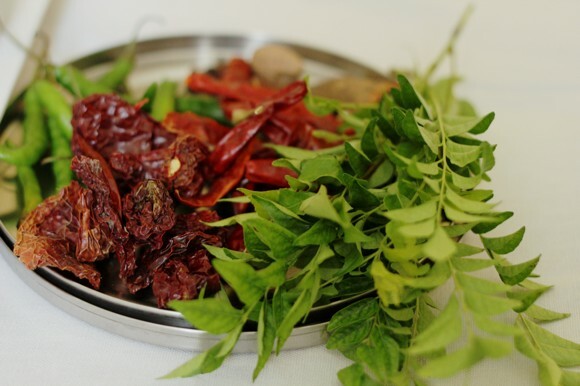 Curry leaves and chilli peppers, very important ingredients! 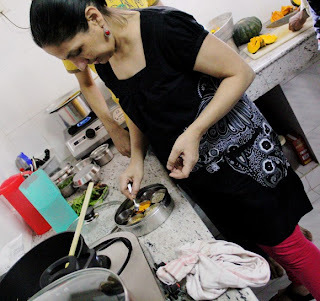 Curious to learn some authentic Indian cooking skills, I signed up for a cooking class with Anu. 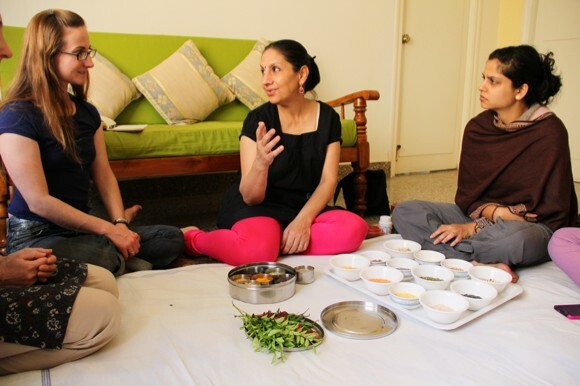 There were 8 or so of us, and she first showed us the spices she keeps in her round Masala tiffin (turmeric, mustard seed, coriander, cumin, black peppercorns, fenugreek, and fennel seed.) Next she had little bowls of each of the different grains and legumes she keeps in her kitchen. Very helpful! The shelves of the grocery stores here are filled with these, but I only recognize a few). Masala tiffin to keep all spices handy (round, on the left) and different lentils, beans and rice. 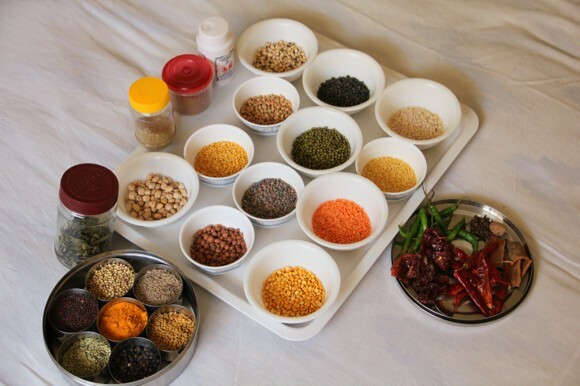 Anu describes her well-stocked Indian pantry. 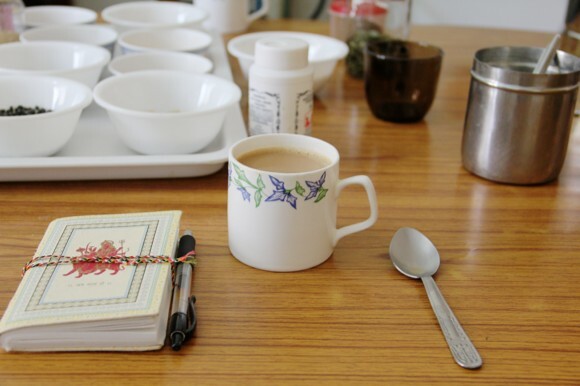 After a break for some delicious chai tea, we joined her in her kitchen to make the day's menu: Daal, Sweet Pumpkin Delight, and Chapatis. I've included Anu's Daal recipe below. It was truly delicious. It seems the secret is in the sauce. Follow her instructions for cooking the spices in the oil, and you'll have a great base for many Indian dishes. 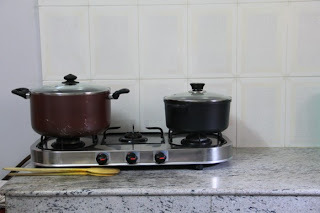 Kitchens here are equipped with two, perhaps 4 propane fueled burners, and that's it! Pressure cookers are very popular for fast cooking hard lentils and beans. Boil the lentils until soft, or pressure cook them to two whistles. You may use either one of the listed lentils or a combination of all three in equal proportions. In a heated pot, add the oil. Add the mustard seeds and heat until they pop or sputter. Add the cumin seeds, curry leaves, and chillies and fry for 30 seconds; then add the garlic, ginger, and onions and fry on a medium flame until the onions are opaque. Add the turmeric powder and fry for 15 seconds on a low flame. Add the tomatoes and mix well. Add ½ cup water and cook on a medium to low flame until the tomatoes are soft. Add the cooked legumes and salt. Water may be added to obtain right consistency. Bring to a boil and turn off the flame. Garnish with ghee and coriander leaves. 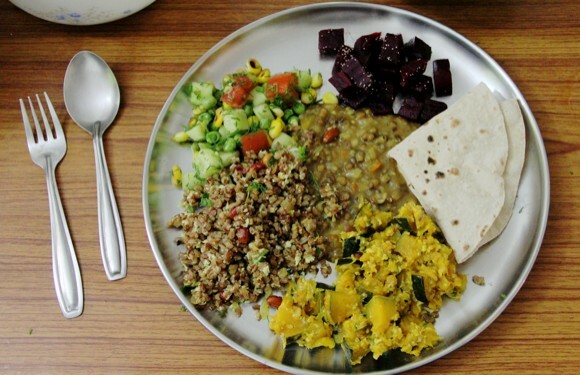 Serve hot with rotis or rice and green salad with onions. Squeeze lime juice over the lentils in your plate, and add a few raw onion slices just before eating to create a divine taste. 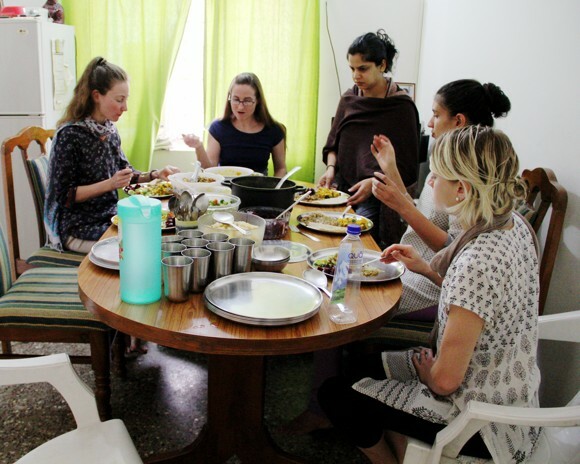 The full meal included many dishes, including beets, a cucumber salad, and a delicious sweet/desserty dish known as kesari bath. Enjoy the photos, the recipe, and if you do make it you should let Anu know, she would be so happy! Amazing! I love that you've been invited over for home cooked lunches! What a great way to sample the authentic food culture in Mysore. I will try the recipe. Thank you dear Cara for your kindness! I like your blog and, your pictures of me and my home are quite flattering! Do try out the simple daad and let me know how it turns out. Thanks for reading our blog, Anu! I had all ingredients on hand (curry leaves and chilles tucked away in the freezer! )and made the lentils tonight. Such a warm and delicious flavor. It was great for this cold Iowa evening: 16 degrees, fahrenheit! It's a good thing you own a pressure cooker these days Cara. 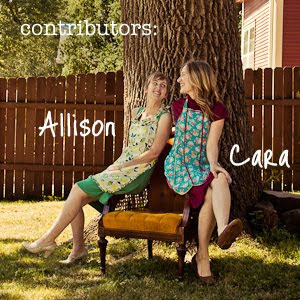 Great blog and great to share. People are intimidated by Indian food, but what you really need to do is go to a good market and stock your spice shelf. I can't say I know where to get fresh curry leaves off Devon St (Chicago's IndoPak home), but there's a lot of good to come of this. Try stirring in some fresh grated ginger at the end to 'spike' the dish a bit.